Magnet locks the screen door automatically and the door can be unlocked by gentle pull/push using the hands. 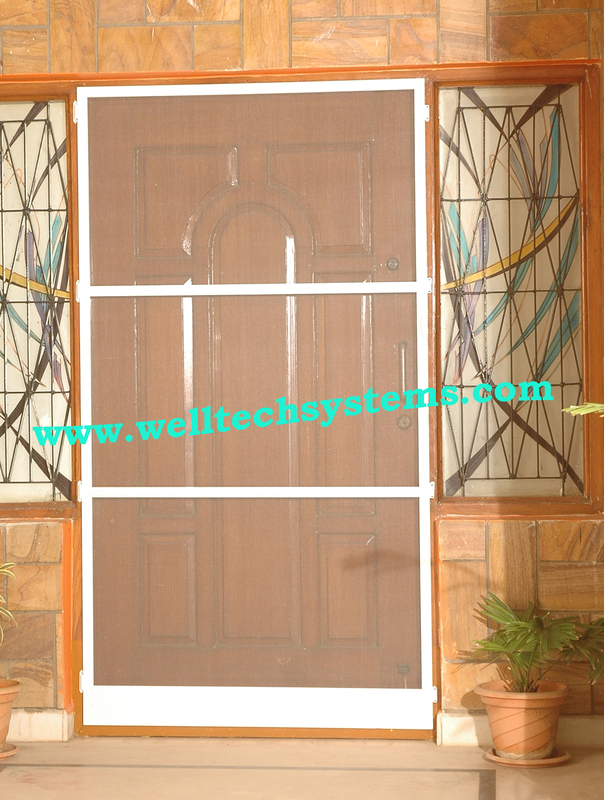 Mosquito Mesh for Single Door, Welltech Systems, Hyderabad. Single Door Retractable Screen is industry standard make using Aluminum profiles and reinforced corners with high grade Nylon. The screens are low priced, easy to install and use. The Single Door screens can be customized to fit to existing doors or new doors of any dimensions. A perfect fit for in-swing or out-swing doors. Shields the entry of mosquitoes. Screens are hidden from view, the beauty, function and esthetics of the door is maintained. A wide variety of colors are available to make the housing fit in with your decor. The single door handle allows for easy use for all ages. Fiber glass gate, Aluminum Gate and Stainless Steel Gate, door handle, magnets and hinges are additionally provided to improve the performance and usability of the Single Door.